Writers Note: I have only played The Witcher 3 base game. I have not played any of the other games or DLCs, nor have I read the books. If I am missing crucial plot information, that is why. More often than not, ambitious video games that try to be about an important topic end up just mentioning a topic repeatedly without offering any engaging commentary on it. Bioshock tried to be about Ayn Rand’s philosophy of Objectivism, but doesn’t represent the philosophy accurately and ultimately just used a complex philosophy as mere window dressing. Watch_Dogs purported to be about modern surveillance states, but reduces the nuanced tradeoff between security and privacy down to lame mini-games and bad jokes rather than take any serious look at a prescient issue. 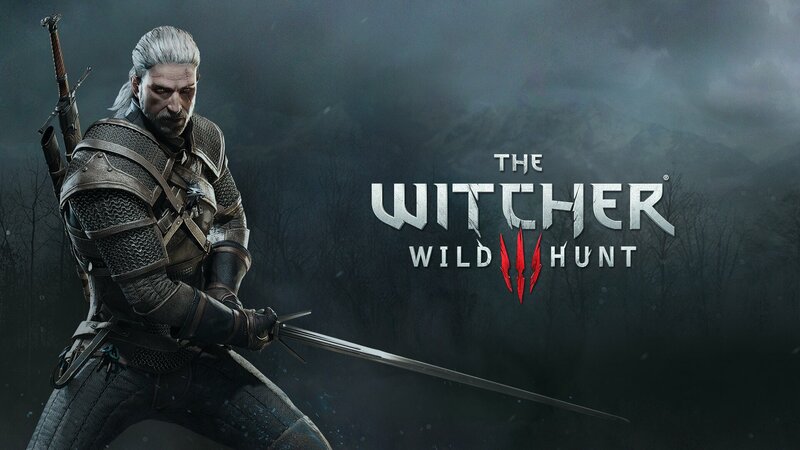 But then there’s the Witcher 3, a ridiculously massive game which delves into a huge range of interesting thematic issues including father-daughter relationships, infidelity, social etiquette, the value of traditionalism, social toleration, the psychological costs of warfare, and many others, yet somehow still manages to say more interesting things about the nature of good government than perhaps any other game I have ever played. That’s a strong statement but I think it’s warranted. The Witcher 3 involves lots of politics, but it’s mostly kept to the background of the more relevant main plot involving Witcher Geralt finding and protecting his missing surrogate daughter, Ciri. Yet lurking behind the thrilling monster hunts, charming characters, and often bleak world building is a political conflict between four major countries, multiple important factions, and dozens of relevant characters who offer conflicting view points on how governments should be run. With a few notable exceptions, these characters rarely state their goals in explicitly philosophical terms, but their views can undoubtedly be plotted along political-philosophical lines. When this set up is combined with some of the best writing in recent video game memory, The Witcher 3 somehow manages to offer a more comprehensive analysis of the nature of government, law, and society than even the likes of the Civilization, Europa Universalis, Crusader Kings 2, and especially Skyrim. First, the premise: The Witcher 3 takes place in a medieval fantasy world complete with witches, magic, and monsters. The continent within the world in which the game’s event takes place is divided between four countries, three of which are at war. 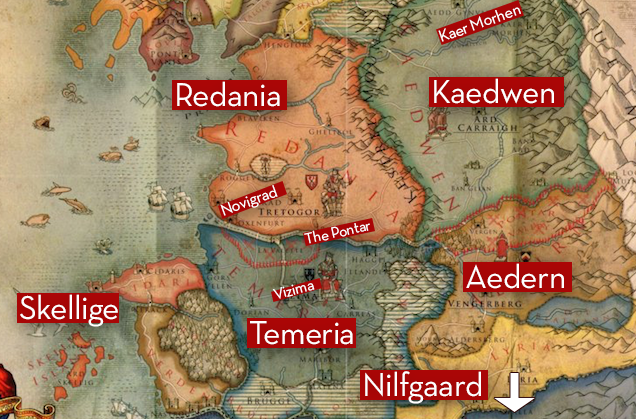 The Nilfgaardian Empire in the south launched a war of aggression upon a northern kingdom (Temeria) which was eventually swallowed up by neighboring kingdom, Redania. The Nilfgaardians also constantly battle the Viking-esque Kingdom of Skellige, which is based on a group of islands off the coast of the continent. Meanwhile, the neutral city-state of Novigrad sits between Nilfgaard and Redania as the two nations vie for control over it through diplomacy and subversion. 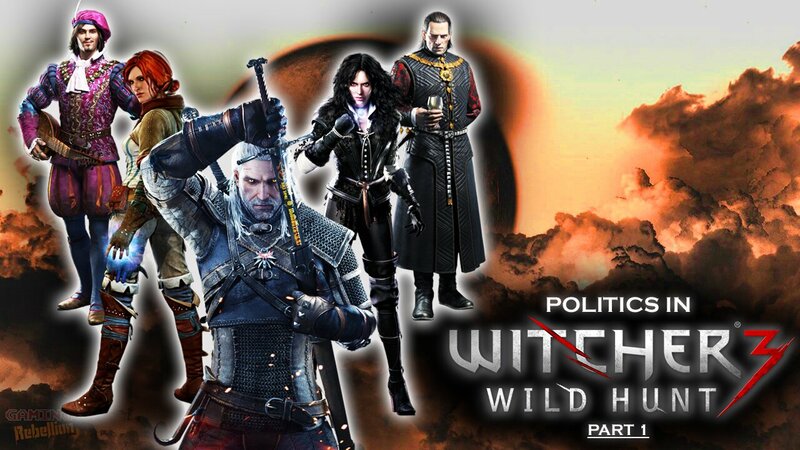 Though Geralt’s primary quest is only tangentially related to these political affairs, he has connections with all four countries. Ciri is the real daughter of Emperor Emreis of Nilfgaard who enters into an uneasy alliance with Geralt for the sake of his daughter. But Geralt is also from the north and has numerous friends and connections within Redania, especially the right-hand man of the former Redanian king. Meanwhile, Geralt is an old comrade of one of the leading lords of Skellige, which was also where Ciri spent much of her childhood. 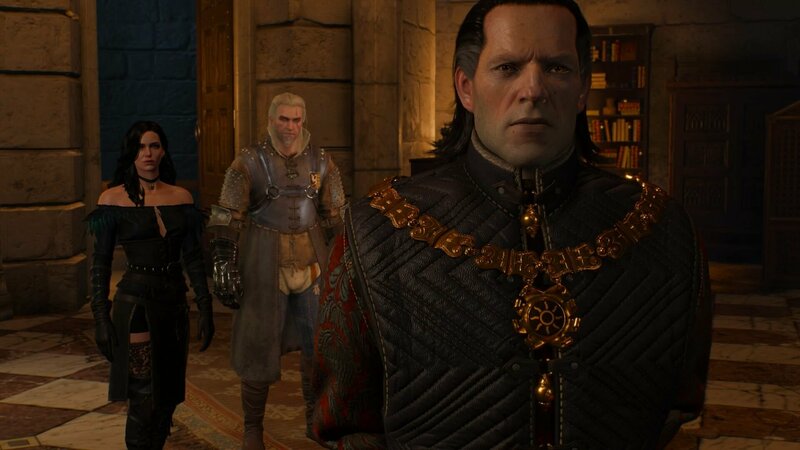 And while Geralt doesn’t have much of a connection with the Novigradian government, he has many friends amongst its citizens, including his former lover, Triss. Throughout the course of the game Geralt is offered the opportunity to influence all four countries, and even decide the ultimate fate of some of them. By immersing the player in this setting and providing ample opportunities to evaluate the merits of the factions at play, The Witcher 3 asks the player to consider the value of numerous factors in judging the virtue of a given government, including nationalism, traditionalism, international aggression, stability, tolerance, leadership charisma, and more. What are the qualities of a good political leader? This political question is addressed the most explicitly of the three questions I’ll discuss in this piece in The Witcher 3. There are two extended quest lines in where Geralt gets the opportunity to determine who ends up ruling a major country. Each time Geralt is asked to consider the implications of a potential ruler’s character, including his (or her) psychological disposition, competence, popularity, and ideological outlook, as they pertain to his/her ability to rule a nation. The simpler of the two quest lines is presented in Skellige. The old, beloved king dies and two likely contenders arise as possible successors: Hjalmar an Craite and his sister, Cerys. They are the children of a famed jarl of Skellige and both have admirable qualities which potentially qualify them for leadership as well as potential weak points which disqualify them. Hjalmar is a great warrior, brave, charismatic, and possesses the classic Skelligan tendency to lead from the front which naturally inspires the loyalty of others. On the other hand, he is known to be reckless, sometimes at the expense of the safety of himself and his comrades, and his tendency for conflict makes him a weak diplomat. Meanwhile, Cerys is intelligent, clever, insightful, and possesses a healthy cautious. But her cautious disposition doesn’t fit in well with Skelligan culture, and the islands have never had a female ruler, so the stability of her rule is by no means guaranteed in the long run. Note that the player isn’t just told who Hjalmar and Cerys are and what they’re like (though plenty of characters will offer their opinions when asked). 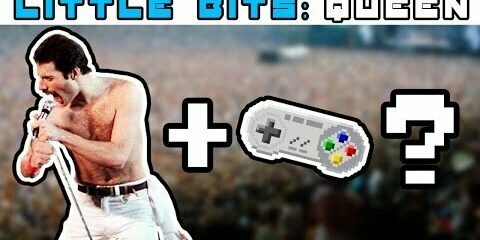 Instead Geralt gets a whole quest devoted to each of them. We see Hjalmar lead troops into battle against a frost giant. We see his bravery in the heat of the moment, but also the costs of his blind rush for glory. We see Cerys try to lift a curse from a jarl. We see her commitment to her goals even in the face of ridicule, but we also see that she is ultimately unable to lift the curse on her own. Whenever possible, The Witcher 3 shows, rather than just tell. Eventually I chose Cerys because I favor peaceful diplomatic courses of action over wasteful warfare. 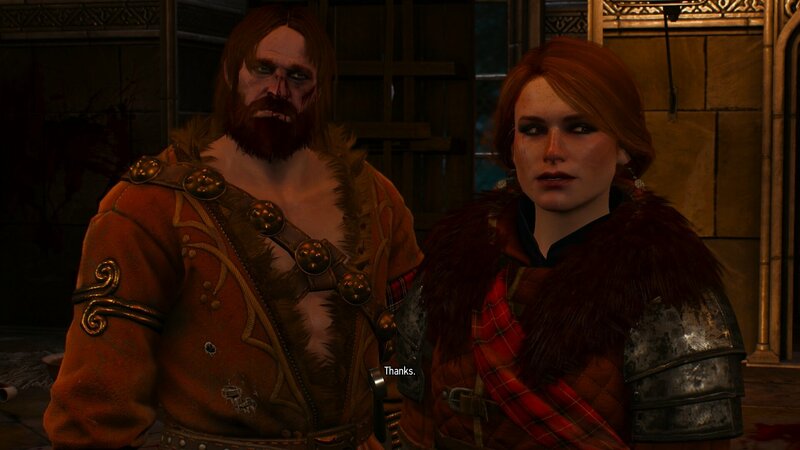 At the end of the game it was revealed that Cerys’s influence managed to undo centuries of warfare-culture in Skellige and the islands became devoted to peaceful production and trade. That’s great! It’s exactly what I wanted to happen. Actually, it’s too great. I was disappointed that The Witcher 3 would be so clumsy as to assume that a single leader (noted for her lack of traditional charisma) was able to reverse deeply entrenched cultural norms in less than a single life time. It’s a major contradiction to a long term theme in the game which argues exactly the opposite idea, as I’ll describe with the next question. Then there’s the case of the Kingdom of Redania. 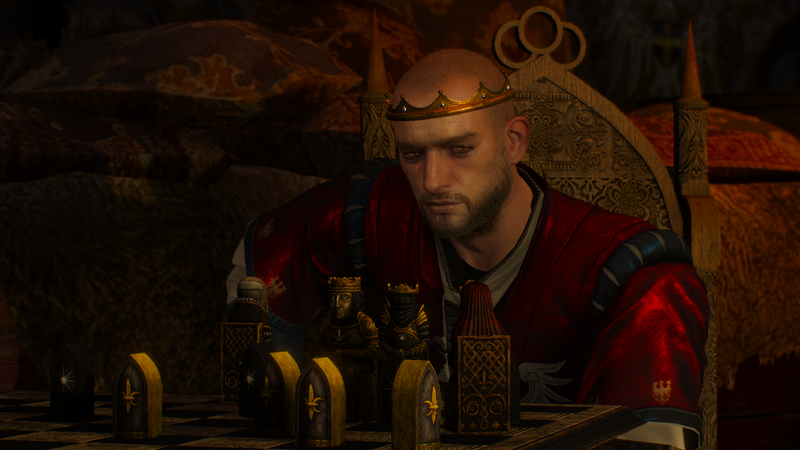 At the start of the game, the northern kingdom is ruled by Radovid, a figure known simultaneously for his military brilliance and his budding madness. Radovid is credited for singlehandedly turning the tide of the Nilfgaardian invasion through his military strategies, but at the same time he embraced the Church of the Eternal Fire and carried out ruthless persecutions of magic users and non-humans in his territory. Concerned by Radovid’s instability, a group of prominent Redanians conspired an assassination plot. 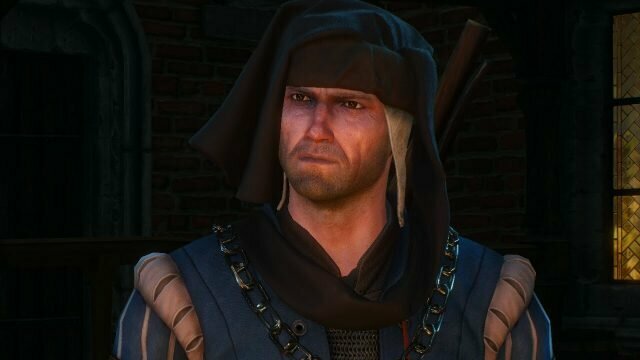 The assassins included former Redanian spymaster and frienamy of Geralt, Dijkstra, as well as the patriotic freedom fighter, Roche. Geralt is ultimately able to choose who will lead Redania between Radovid, Dijkstra, and Roche. I love stories about civil wars and contests for thrones (ie. Game of Thrones, Pillars of the Earth, Skyrim, The White Queen, etc.). But what really annoys me is a tendency in these stories to make all of the sides of a conflict non-ideological. All too often, these stories end up with a bunch of ruthless, amoral thugs fighting each other for narrowly-self-interested gain, rather than present any real ideological argument for why any one person should have the throne over the other. For instance, though Game of Thrones is better than most, the contenders to the Iron Throne largely fall into this trap. Is there any appreciable difference between the long term administrative plans of Daenerys Targaryen, Cercei Lannister, Renly Baratheon, Stannis Baratheon, the Baratheon/Lannister children, Rob Stark, etc. I mean, I’m ok with there being one Petyr Baelish who is just a cunning, non-ideological monster, but in real life rulers are supposed to have plans and ideas which differentiate themselves from their competition, especially if they want to inspire legions of men to risk their lives for the cause. Literally one of my favorite moments in any video game I have ever played occurs when Dijkstra makes his pitch to Geralt to kill King Radovid. Here is the video, the speech starts at 1:45. Somehow Dijkstra says everything that I always wanted a potential ruler to say in every story about a contested throne ever made. He has a vision for the throne, and not just any vision, but a rational one not based on religion nor ancient rituals, nor dumb cultural norms, but based on productivity, commerce, science, and order. After hearing that I didn’t just want Dijkstra to rule Redania, but also Skellige and Nilfgaard, and preferably Westeros too! I would hope most players would have a similar reaction to me, but I’d also understand if some were repulsed by Dijkstra’s pricklier qualities. He was, after all, essentially the head of a secret police organization, and later on became a crime lord. His disposition is generally callous and intimidating, even if it is compensated by wit and a refreshingly honest comport. In contrast Roche captures more of the roguish qualities typical of a heroic rebel. He’s a front lines guerrilla fighter who literally lives in a cave with a band of bow-and-arrow wielding loyalists (including a beautiful, headstrong second-in-command). Unlike Dijkstra’s tendencies toward intrigue, Roache has an up-beat persona fit for inspiring support. And most important of all, Roache is a true Redanian nationalist who seeks to replace Radovid so that Redania may return to its cultural roots, rather than succumb to the Church’s influence, or Nilfgaard’s cold progressivism (which is rather similar to Dijkstra’s vision). Of course I chose Dijkstra, and I think everyone should. But I still respect the well-conceived diversity of choices at play.